I have to admit, I was really curious to start reading Girl Out of Water. I follow Laura Silverman on Twitter, and all her tweets about the book made me really interested to check it out. I'm glad I did. This book would be perfect to add to your Summer TBR list! There were a lot of interesting characters in the story, including the main character, Anise, who wanted nothing more than to spend her summer hanging out with her friends and riding the waves. When all her plans changes, she takes them in stride, even when she totally doesn't want to, because.. family. They're everything, right? Anise has a pretty awesome family; her dad, aunt and cousins were all really great. She has some pretty great friends as well, both at home, and the new ones she meets along the way. And, of course, Lincoln is totally awesome as well. The storyline for this contemporary novel was fun and very entertaining. (I am a sucker for contemporary novels, so this book was right up my alley. *wink*) While the book had a few serious moments in it, it was mainly a really light-hearted read. I loved the summer setting, and though it's not the summer Anise expected to have at the beach, Nebraska still sounds pretty cool. All the descriptions of Anise's home in California totally made me want to BE at the beach. It sounds like an awesome place to live. Laura did a great job with the descriptions. 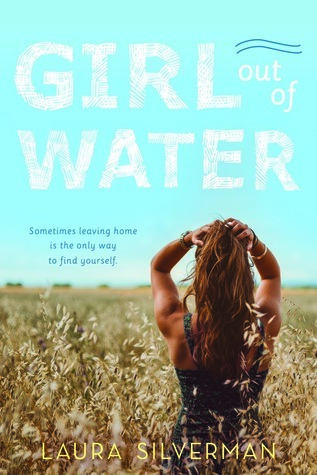 Overall; Girl Out of Water was an interesting summer themed read, and I'm glad I had the opportunity to check it out! Definitely add this to your TBR if you're in the mood for a fun summer read.